Do you have a negligence case or do you have a product liability case based on a design defect? South Florida offers lots of dining opportunities — we have everything here from mom and pop cafes to fast food stops, to restaurant franchises and fine dining establishments. The restaurant business is extremely competitive, with each establishment trying to compete for diner dollars with everything from happy hours, menu specials, trendy designs and decor and comfortable seating, including the highly sought after restaurant booth. As we all know (at least in my opinion), most diners prefer to sit in booths rather than at a table. That’s because, restaurant booths offer more room and privacy – for example, couples on date nights like sharing a booth. Families enjoy booths because they offer a practical way to keep the kids corralled at the table during the meal. Seniors like to sit at a booth while dining because the cushions are simply more comfortable than the chairs offered at the restaurant’s tables. What happens when you slip and fall from a restaurant booth? Falling from a booth or other seating, elevated or otherwise, in a restaurant happens more often than one might think. Sometimes, these accidents occur because of design flaws in the seating or because the carpeting next to the booth is frayed or the floor is slippery. There may be no caution or warning signs; a lot of times the restaurant patron simply forgets when they leave their booth that the seating is raised and a slip and fall injury results. 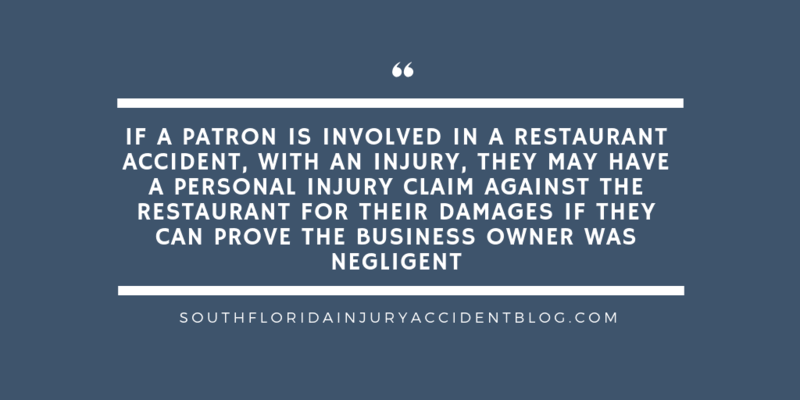 Under Florida premises liability law, if a patron is involved in a restaurant accident, with an injury, they may have a personal injury claim against the restaurant for their damages if they can prove the business owner was negligent – (under the law, restaurants have a duty to provide a safe environment for those it has invited on its premises for business purposes and to warn them of any known dangers). These falls, usually (and thankfully) do not often cause permanent life-altering injuries. Still, serious damage can result with broken arms, legs, ankles, toes, fingers, or even slight concussions and neck injuries. Life at work and at home can be changed for weeks or months after this kind of slip and fall injury. Consequently, victims can seek compensation for pain and suffering, lost wages, scarring and disfigurement, past and future medical bills, etc. Be aware, at the scene of one of these falls, you should expect the restaurant manager to make out an incident report – they may tell you that the report is being prepared for your protection but you should know that’s where the restaurant’s defense will start. Therefore, you should take pictures, make a report, get names of witnesses, ask for any video surveillance to be preserved and seek immediate medical help. How Do You Prove The Restaurant, Or The Booth Designer, Was Negligent? You can expect the restaurant’s insurance adjuster and defense lawyers will try and find excuses why this injury is not their responsibility. If you had an alcoholic beverage during your meal, for example, they will argue you are partially to blame. This is called “comparative negligence” under Florida law. They’ll argue that since you stepped up into the booth, you had constructive knowledge of the elevation and it’s not their fault you forgot. They’ll try and minimize your damages — especially the pain and suffering amounts you are claiming. Here’s where an experienced personal injury attorney can help. Not only can your lawyer present and prove your physical injuries and your pain and suffering, your attorney can also hire the right experts to analyze and possibly show how that booth was negligently designed so it is in essence an accident waiting to happen. Is There A Design Defect? Designers may think that a wall of elevated booths with low lighting looks appealing, but an engineer may find the design falls well below safety standards. Don’t assume that just because lots of money went into interior design that sufficient thought was given to protecting the patrons who are going to be visiting the premises. The case can go from a simple negligence case to a product liability case based on a design defect. A good piece of advice if you have been harmed by a slip and fall while sitting in a restaurant booth, is to speak with an experienced personal injury lawyer before you file a claim to learn about some of the issues that can arise with these claims, including knowing which causes of action to pursue and knowing who should be held liable for your injuries. Most personal injury lawyers, like Alan Sackrin, will offer a free initial consultation (over the phone or in person, whichever you prefer) to answer your questions.